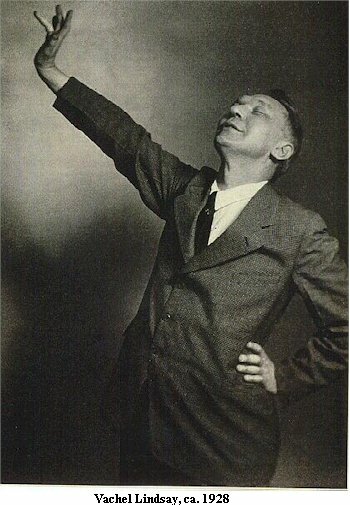 VACHEL LINDSAY, poet, born (d: 1931); His exuberant recitation of some of his work led some critics to compare it to jazz poetry despite his persistent protests. Because of his use of American Midwest themes he also became known as the “Prairie Troubador.” Today, his poetry is no longer fashionable, which is too bad since it contains a rhythmic vitality that has all but gone out of contemporary cerebral poetry. He is probably best known for this poetic apostrophe to the Salvation Army in “General William Booth Enters Heaven,” although it is questionable whether he ever made it past the pearly Gates himself, since he not only liked boys too much, but ended his days a suicide, both offenses that would remove his verses from today’s suburban libraries if the PTAs only knew. In his 40s, Lindsay lost his heart (like so many others) to the dazzlingly good-looking Australian composer and pianist, Percy Grainger, as had the Norwegian composer Edvard Grieg before him. Lindsay killed himself (horribly, swallowing Lysol) in 1931, the year before Hart Crane leapt into the sea. His only biography was published during the Eisenhower years, a decade before homosexuality was officially invented. If it took biographers almost a century to acknowledge Whitman’s Gayness, Lindsay should be due for a really serious biography around 2021.